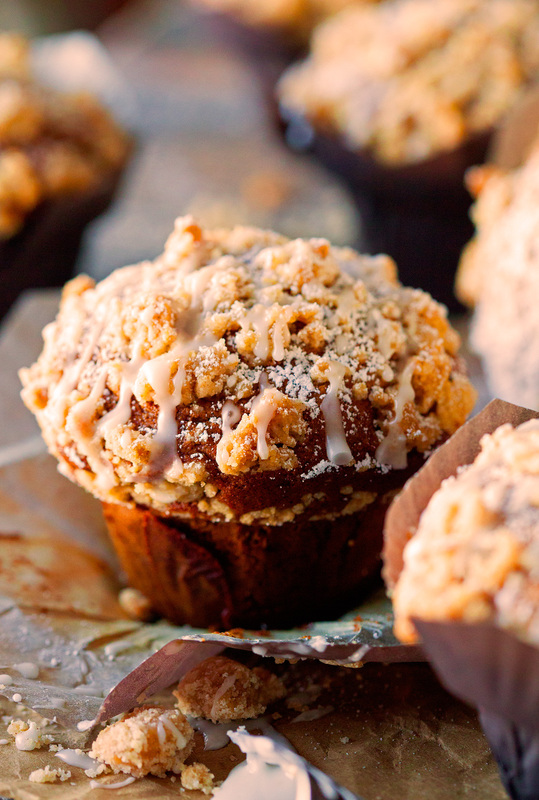 These muffins are calling my name and there’s nothing I can do but dive right in. Also, there needed to be at least 1 gingerbread recipe on my blog this year. Because you guessed it, I am head over heels. I happen to really, really, really like ginger and all the other spices that are common in gingerbread baked goods. Cinnamon, ginger, molasses… can’t you just imagine the smell in your home when these are baking away?! Ugh – I can’t even. And no coffee cake anything is complete without a thick, crumbly, and buttery streusel topping. Lots and lots of it. Drizzled with a simple glaze. You tell me if life gets any better than this ;). If you need proof, I’d suggest you whip up a batch ASAP. One of the most important things I haven’t even mentioned yet. These muffins are JUMBO. Which means your break will be longer and even more delicious. There is such a thing as a jumbo muffin pan (maybe add one to your Christmas list? ), but just in case you don’t have one yet, you can of course bake them in a regular pan. Instead of 6 muffins you’ll end up with 8-10 in which case you can just enjoy 2! 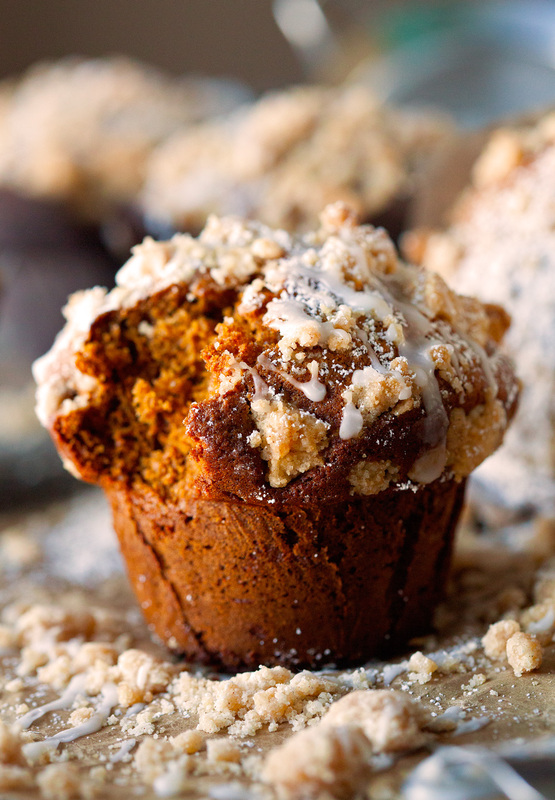 Coffee cake and gingerbread are coming together in a beautiful muffin. Christmas morning breakfast is delicious! Preheat oven to 375 degrees F. Line a jumbo muffin pan with liners or grease very well. 1. Start with the streusel topping, combine sugars, cinnamon, ginger and salt in a medium bowl. Add melted butter and whisk to incorporate. Add flour and stir until just combined. Set aside. 2. In a large bowl, combine flour, salt, baking soda, baking powder, cinnamon and ginger. 3. In a separate bowl, whisk together brown sugar, egg and milk. Slowly add wet ingredients into the dry and stir until barely incorporated. Finally stir in molasses and butter and mix to combine. Don't over mix. It's okay if some lumps remain. 4. Evenly divide batter between the 6 muffin liners. You will be using the entire batter and fill each muffin tin pretty full. Sprinkle with all of the streusel topping. Put into oven and bake for 18-20 minutes or until a toothpick inserted in the middle comes out clean. Remove from the oven and let muffins rest for 2-3 minutes in the pan or until you're able to invert the muffins and transfer them to a cooling rack to cool completely. 5. Meanwhile, whisk together the confectioners' sugar and heavy cream until smooth. 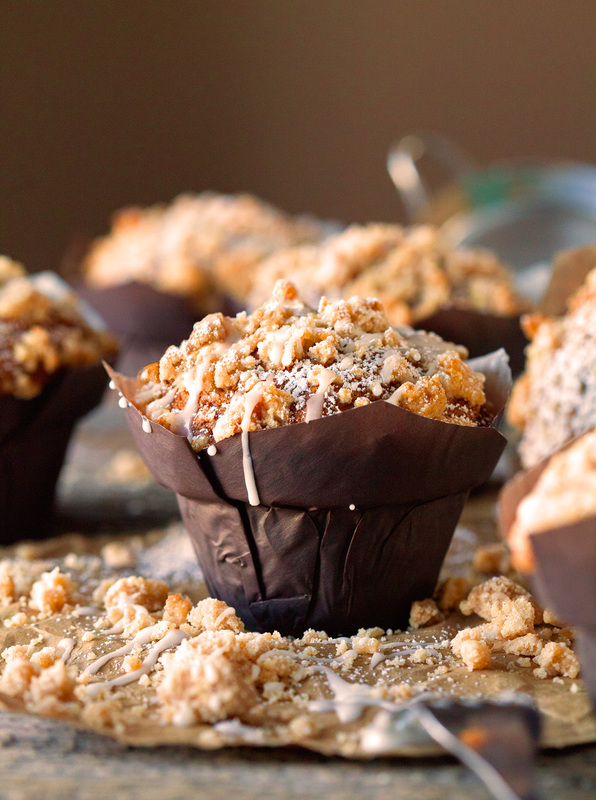 Drizzle desired amount over each muffin and enjoy! I would love to make these, but I just noticed that you have ground ginger listed twice in the ingredients for the muffins. Could you please help??? Thank you in advance!! Very nice recipe!! 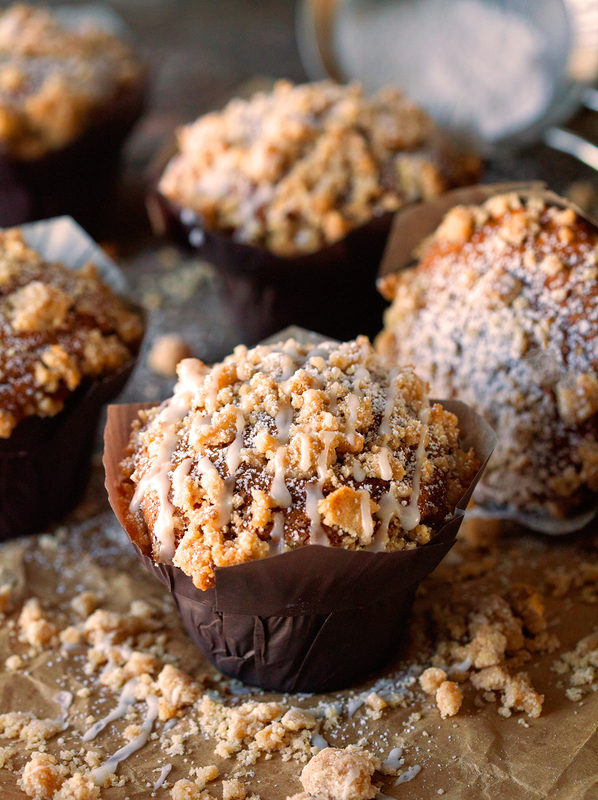 These muffins are Christmas perfection!! 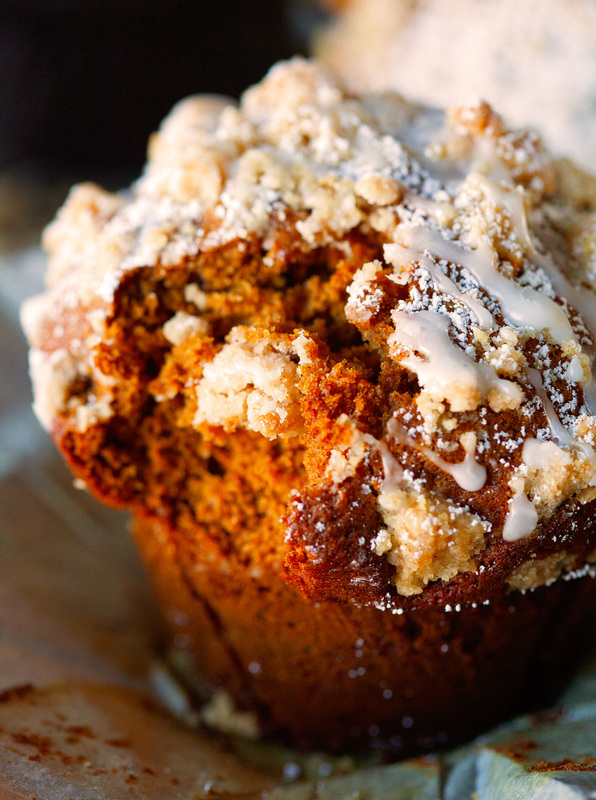 LOVE the gingerbread + coffee cake idea, so fun! 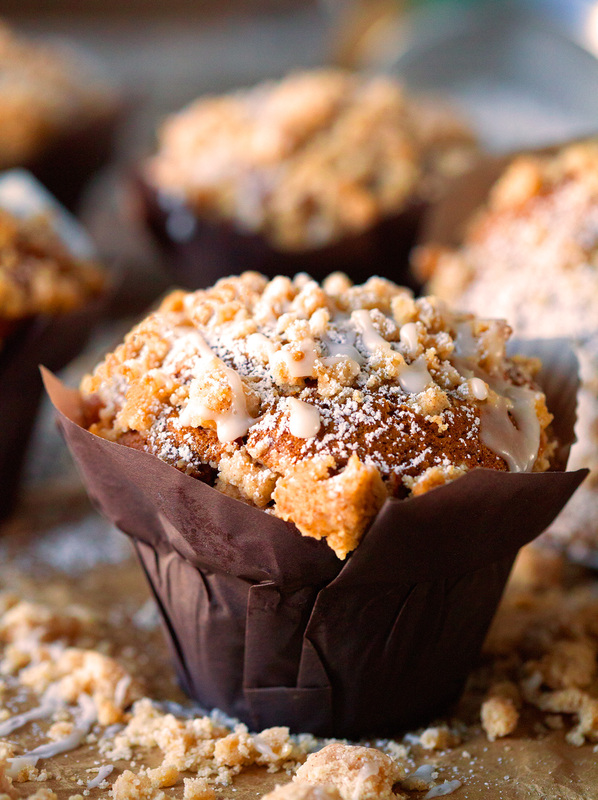 Oh my gosh that streusel on top! Great pics and I like the muffin liners, too! These would be perfect for Christmas breakfast!!! These are just perfect, Kathi! That streusel! What a fab breakfast, brunch item, snack, (etc!) for this time of year! Pinning. 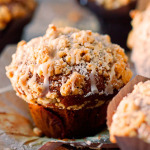 these muffins look absoutely amazing, Kathi! I haven’t had anything gingerbread yet, and that needs to change! Love that they are jumbo, and that crumble topping and glaze puts them over the top. LOVE! Can you tell me how much flour the streusel calls for? 3/4…? Thank you! “They’ll last up to three days…” Oh, no, they won’t, not with me being a huge gingerbread lover, and the only one eating them!!! Hi, I was wondering if there is a way to replace molasses with a different ingredient? I would like to this recipe for Christmas, but I can’t find molasses in any of the stores in my area (I am not from USA). I made these and was disappointed as it spilled over onto the bottom of my oven and started to burn. It said to fill 6 muffins and I could have easily made a dozen large muffins. Glad it was a trial run as I’m making them for tea get together with friends. Made these for an open house on Christmas. Baked up 12 muffins in a regular muffin pan. Look outstanding! So the muffin came out flat do you use cake flour instead of in all purpose flour?